Charlotte. NC’s St. Patrick’s Day parade dates back to . For a complete history of the parade, click here. Saturday, March 18, 2017 starting at 11 am. The Parade will start at N. Tryon St. and 9th Street in uptown Charlotte. It then marches south to 3rd Street where it takes a left and marches down 3rd St. to Caldwell. View a larger printable PDF version PDf the Charlotte. 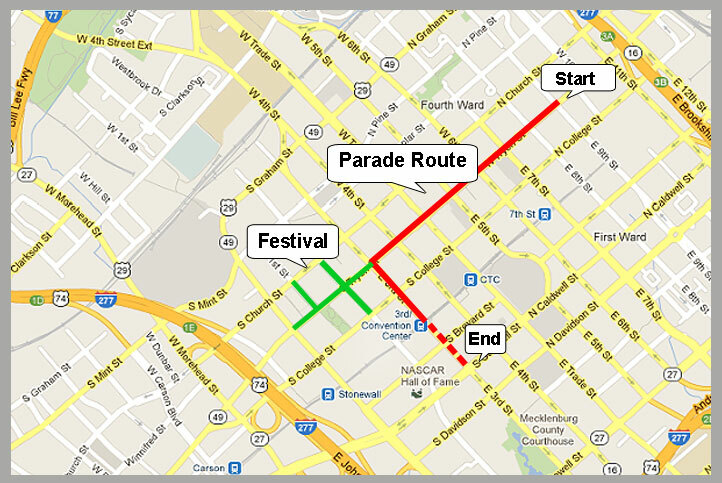 NC St. Patrick's Day Parade Route Map here. The Charlotte St. Patrick’s Day Parade is a non-profit event, open to the public, that is produced by the Charlotte St. Patrick’s Day Parade Foundation, Inc., a 501(c)3 non-profit organization. The Parade is open to pipe & drum bands, musical groups, neighborhood associations, schools, alumni groups, cheerleading and drill teams, international organizations, police, fire, elected officials, commercial businesses, and anyone else who wants to be Irish for a day. The parade will step off at 11:00 A.M. Check out the Map Page for the complete parade route. The Charlotte Goes Green festival is also on Saturday, March 18, 2017 and runs from 10:00 AM until 6:00 PM and the festival has no admission fee. The festival is located on S.Tryon St. starting at 3rd St. and going down towards Stonewall St. & includes Levine Avenue of the Arts. The festival begins where the parade turns left on S.Tryon St. The entertainment stage is at the Levine Avenue of the Arts end.